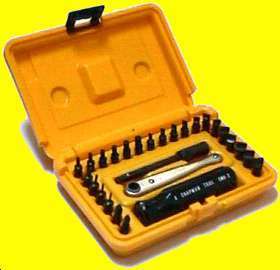 These kits are designed to meet the needs of a broad customer base for industrial assembly, commercial services and the precision hobbyist, yet they allow you to easily customize a kit by selecting additional adapters as you see fit. Our product line up includes: Ratchet, Extension, Handle,and nine Adapter head styles. These are available individually or as pre-packaged Kits, suitable for a wide range of tasks. The adapters can easily be reground to a special shape by the customer for specialized applications. All materials used in our products are 100 % made and assembled in the United States. The improved Extension with lower stop 'ears' and set screw is designed for greater versatility as shown below. 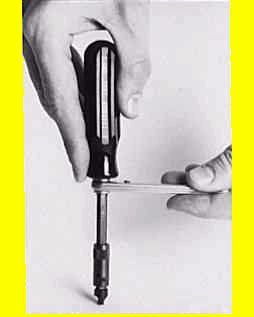 The extension can be used alone with either the ratchet or screwdriver handle. Extensions can be stacked together for a longer reach. A set screw in the barrel is used to lock in the adapter bit or another extension. The Screw Driver Handle ( part no. CHAP.CMH-3 ) is designed for comfortable, quick turning of fasteners while offering a precise feel for final tightening. 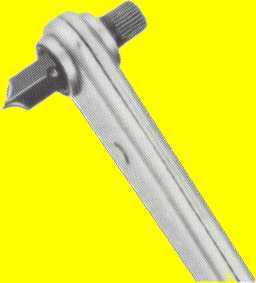 CHAP.CMH-3 W/SS Screw Driver Handle with a set screw in the barrel is used to lock in an adapter or the extension. 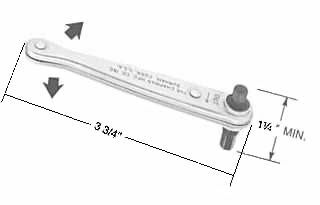 The handle, extension and ratchet combination can be used as show below, which allows for quick setting of the fastener and the final torque advantage of the ratchet. An unbeatable combination. 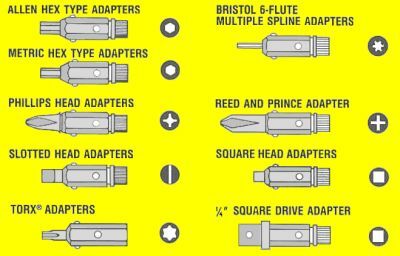 Adapters are available in these head styles: Allen Hex Type sizes; Metric Hex Type sizes; Phillips Head; Slotted Head, Bristol 6-flute Multi-spline; Reed and Prince; Square Head; TORX and Gunsmith Specialty Slotted. In addition, the 1/4" Square adapter is used to drive your standard sockets. 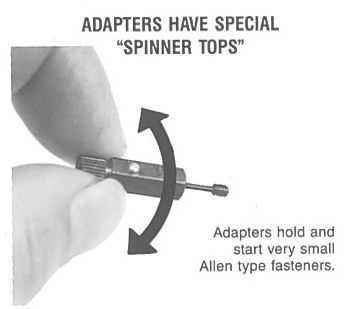 Adapters are available in pre-packaged kits for a specific style of fastener and as individual adapters (referred to as open stock). 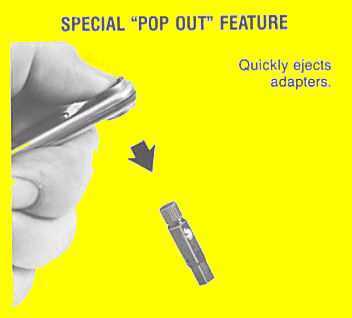 Dimensional specifications for each family of adapters can be found under Product Specs in the contents. We do produce custom kits for OEM special applications. Contact us if you are interested in developing a shrink wrap custom kit under your company label.